As a great philosopher once pondered, "If an awesome party goes down in Montauk and no one can get there, is it still awesome"? We may never know, because The Ivy at Solé East will get you there too, starting this weekend. 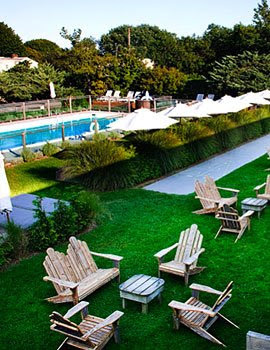 All summer, the guys behind Chloe81's fashionably ballyhooed "Ivy" bashes are offering this every-other-Saturday package: a poolside fiesta on Solé East's expansive, well-hammocked Montauk lawn, plus two complementary booze-stocked buses to take you all the way out to where Jim Carrey sunshined his eternal mind. Each festivus will be fueled by a DJ troika (Gregory Lynch, Matt & Maia), eats from Solé's Backyard (skirt steak sammies, Angus beef sliders, Long Island duck taquitos...), a full bar pouring free premium tequila, plus 34 wines, custom cocktails like a cherry-pepper Bloody Mary and, to really Thai one on, a lemongrass daiquiri. As for the transpo, the two no-fee, 30-capacity, bathroom-equipped buses depart Manhattan at 11am and noon, each serving gratis suds of as-yet-undetermined provenance, though whatever it turns out to be, it's bad etiquette to look a gift-beer in the widemouth. To kick things off this Saturday, Ivy's also throwing an after-party at Lily Pond; if you're Montauk'd out, Solé East offers free rides to the train & Jitney stations, though you will have to pay for your trip back to Manhattan -- begging the question, if a stranded man whimpers and no one's around, is he still a wiener? I'm going! But I won't tell you stalkers which weekend ;) you'll have to stalk me enough to figure it out yourself. Wait, so the bus, the party, and the liquor are all free? I don't get it. YES. You just need to get your own ride home. word. Wow. That sounds too good to be true. But I'll give it a try. This sounds amazing. Does anyone have more info? Email me at kimberlygeneric@gmail.com if so!